Experience a one-of-a-kind cruise adventure on the Carnival Horizon! Discover a world of fun and adventure on the new Carnival Horizon. The onboard delights start with the innovative SkyRide, a first in the cruise industry. This pedal-powered aerial ride takes riders on an 800-foot track that sits, suspended 150 feet above sea level. 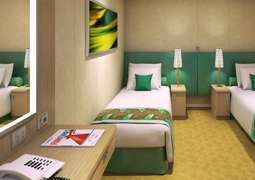 Foodies will be delighted with the range of specialty restaurants onboard including the Bonsai Sushi Bar, Guys Burger Joint, Blue Iguana Cantina, Fat Jimmy's C-Side BBQ, and Ji Ji Asian Kitchen. Your kids will love the variety of activities offered at the Kids Club and Teenagers Club. They're sure to have fun making friends and taking on exciting new adventures. While they're been entertained by the highly trained counselors, kick back and relax on the Adults Only Serenity Deck. In the evening enjoy a Vegas-style show before dancing the night away to the beats of top-class DJs. If you prefer a quiet night, head to one of the many relaxing bars or coffee lounges situated all around the Carnival Horizon. 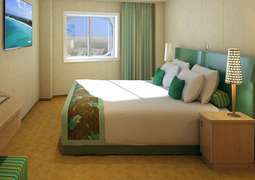 Experience the ultimate in luxury in one of the Havana Suites or Staterooms. These rooms all have exclusive access to the Havana Bar and Pool. 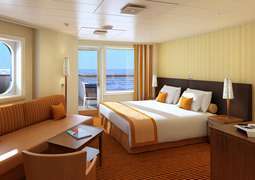 The Carnival Horizon offers a wide range of staterooms to suit every budget and family size. Those traveling with children will love the new Harbor Family Suites. Kids in these rooms eat free at most specialty restaurants and the whole family has access to the Harbor Lounge filled with family-friendly games and activities. Carnival Cruise Lines have provided an incredible selection of restaurants onboard that even the pickiest eater will be satified. Big Juicy Burgers await the whole family at Guy Fieri's Burger Joint. The Seafood Shack provides New England-style seafood with a 360 degree view of the ocean. If you prefer a juicy steak, you will love the Fahrenheit 555 Steakhouse where you can choose between a wide variety of steaks cooked exactly how you prefer. There isn't a moment of boredom aboard the Carnival Horizon. Adrenaline junkies will love the pedal-powered Sky Ride. Test yourself on the Sky High ropes course or shoot some hoops on one of three basketball courts. The Sportsquare includes mini-bowling, pool, mini-golf, and volleyball. When you get tired head to the movies and enjoy a full-size IMAX screen or 3D movie. The kids will love the Dr. Seuss Waterworks filled with water slides and mini pools. If you're in the mood to take it easy, head to the Cloud 9 Spa for a day of relaxation. 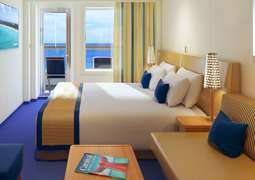 Carnival Cruise Lines are all about relaxation, and this is reflected in the dress code. Casual dress is the order of the day and in the evening. Head to one of the specialty restaurants or formal nights if you want to dress up.